Inspired by community input and the site’s rich history, Brooklyn‘s new Domino Park reconnects the Williamsburg neighborhood to New York City‘s East River for the first time in 160 years. But beyond repurposing, renewing and reconnecting (AKA: the 3Re Strategy) the land, the 11 acres of post-industrial is further regenerating the neighborhood by adaptively reusing some of the industrial buildings to provide 700 units of affordable housing. 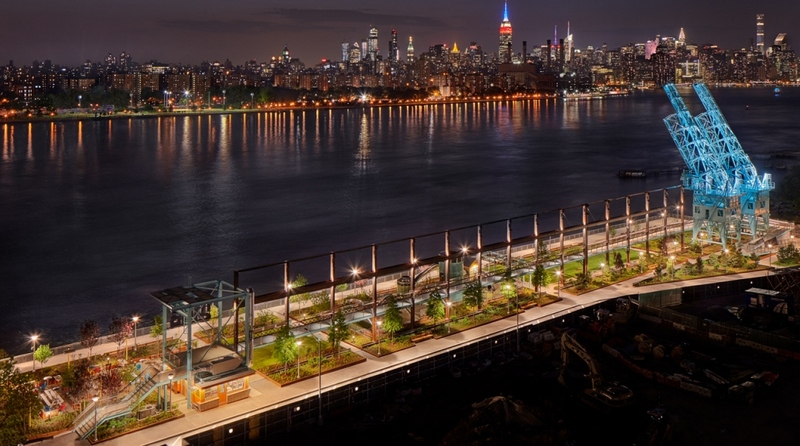 The revitalizing new park was designed by James Corner Field Operations, the same firm that helped design the High Line Park. 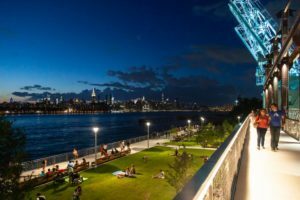 Sustainability and resiliency measures are central to the design, construction and ongoing management of Domino Park. The park is raised above FEMA flood elevations with many native plant species that reduce stormwater runoff and function as an absorbent sponge and first line of defense for the neighborhood. 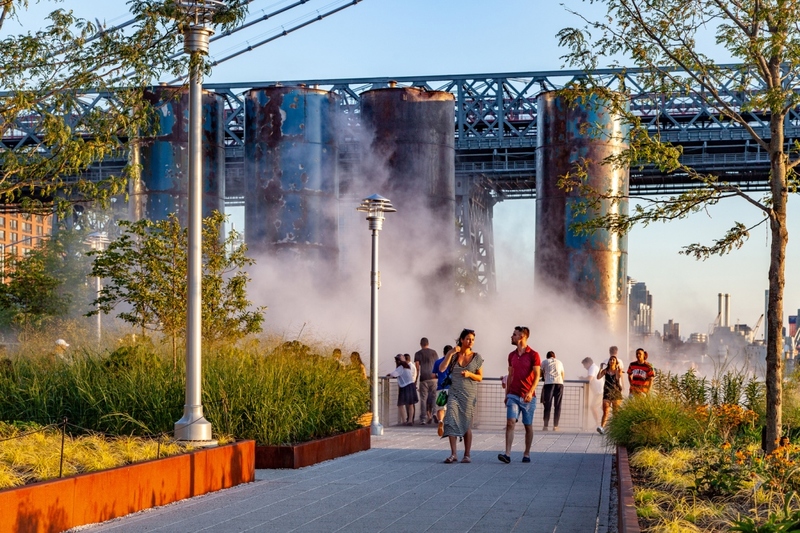 Dating back to 1856, the Domino Sugar Refinery was once the largest and most productive sugar refinery in the world. At its peak of productivity, it produced up to 98% of the sugar consumed in the United States. Closing its doors in 2004, the Domino Sugar Refinery was the last major active industrial operation on Brooklyn’s once bustling East River waterfront. The park is a tribute to the story of this site and is dedicated to the diversity and resiliency of generations of Domino workers, their families and their neighborhood. 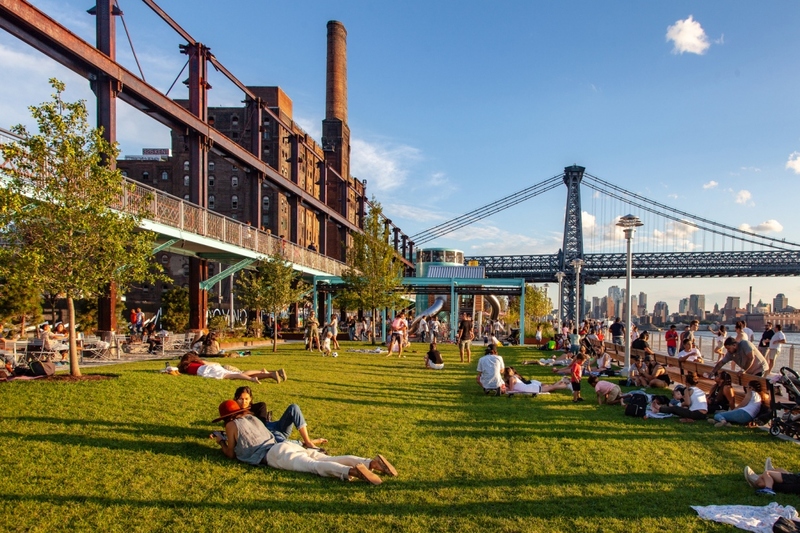 Domino Park represents a commitment to deliver 6-acres of public open space to the North Williamsburg community, providing much-needed open space for local residents, while honoring and celebrating its industrial working waterfront history. The overall development by Two Trees includes transforming the Refinery into office space and mixed-use residential buildings with 700 units of affordable housing. 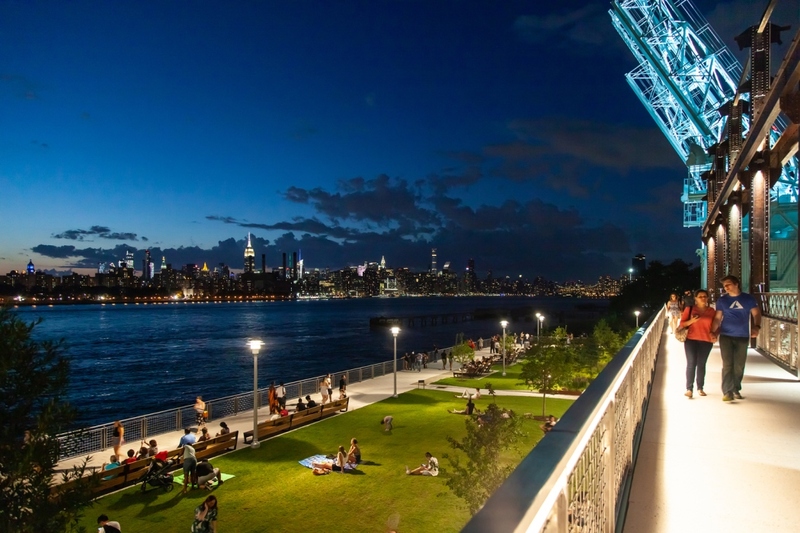 One of the most important first moves was the extension of River Street through the site to reconnect the park to the city grid and to deepen a sense of publicness rather than a perception of a private front lawn for new development. Designed as a city street, River Street also significantly improves east-west connections between the upland and the waterfront, eliminating the need for stairs and ramps and increasing the park’s accessibility. 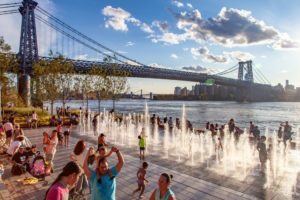 Since its opening, Domino Park has become a magnet, embraced by the diverse community it serves, offering a range of activities such as beach volleyball, a playground, a dog run, a taco stand, water features, lawns and plentiful seating. All images courtesy of James Corner Field Operations. See James Corner Field Operations website.